Every day we strive to be at parents' sides, armed with passion and expertise, making each moment a special one. Pietro Catelli founds Artsana, a sales agency specialising in the production and distribution of medication, which soon becomes a market leader. Following the birth of his son Enrico, affectionately nicknamed Chicco, Pietro Catelli had his greatest entrepreneurial intuition yet: to create a brand specialising in baby care, which would cater for all the needs of children aged between 0 and 36 months. 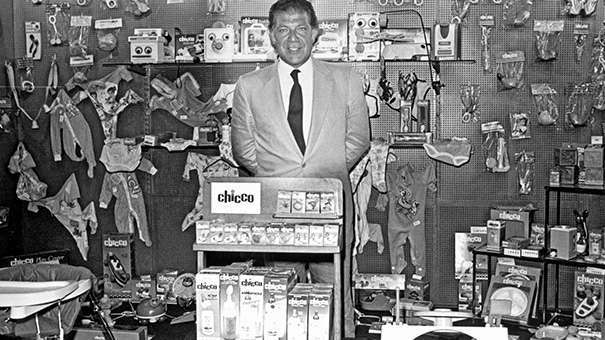 Thus the Chicco brand was born, becoming a reference point for parents within just a few years and establishing itself as market leader in Italy and later worldwide. Artsana opens its European branch in Spain, it expands into the Far East and opens branches in the US, Turkey, Brazil and Argentina. New branches open, including in India, Russia, Mexico and Poland. The extraordinary life of Pietro Catelli has become a biography. On sale in the best bookstores in Italy. We are attentive to the needs and feelings of parents and children. We understand, care about and support them and we have made it our mission to provide the best solutions for them. We know how and when to be there for them, working together in perfect harmony but without ever taking their place. We take what we do seriously and take care to ensure that our products are safe, reliable and meet high quality standards. We have over 50 years' experience in the world of baby care and we continue to build on this expertise through the tireless work of our Baby Research Center. Taking care of a child is a serious business. We know this but think that it is equally important to relax a little and take a light-hearted approach when the situation calls for it. Because parenting is by definition also a joyful and positive experience. Our products are simple, straight-forward and you can easily tell what they are just by looking at them. They are the ultimate in user-friendly design. The language we use is also designed to be plain-speaking yet raise a smile at the same time. Chicco decided to develop, in collaboration with “Mission Bambini” Foundation, an international solidarity project called “Happiness goes from heart to heart”. We observe, get to know and understand babies and young children with the help of experts and parents. Chicco's Baby Research Center is dedicated to carrying out research relating to babies and their mental, physical, emotional and social needs. Solid Passion for life. This is the motto of a Group that identifies passion, sense of responsibility, respect and integrity as its core values.